I tried, I really did. 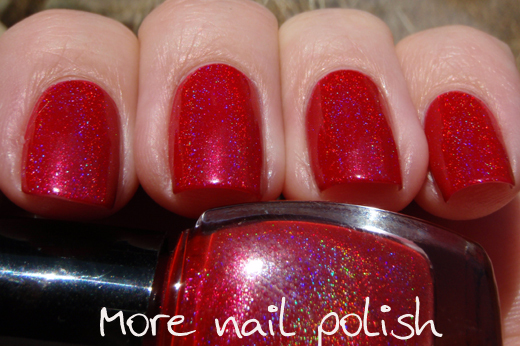 I was trying to make the perfect red holo. 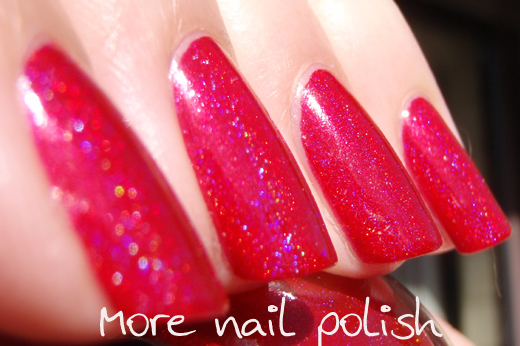 I don't even know if it's possible to create a polish like Ozotic 518 using spectraflair. Even though 518 is still kinda pink, it's way more red than I was able to create. 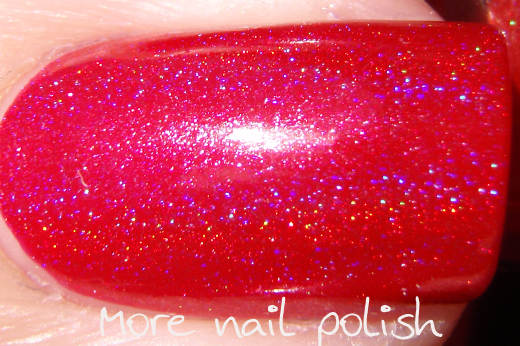 The silvery finish of the spectraflair seems to make the red polish pink every time. Even though this is a pink red, it's still rather gorgeous. I called this one "Houzii's Armour". I named this polish for my sweet sister in law, who fell in love with this polish the instant she saw it. So much so, that I frankened her up her own bottle the very next day. So while the name wont really make sense to anyone else, it makes sense to my family and to her! 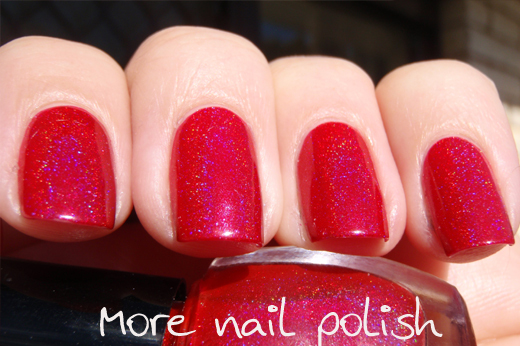 Again I struggled to capture all the holoiness of this polish, but it is there and it is beautiful. 3/4 of a bottle of Ulta3 Fire Truck - I went through my swatch sticks and chose this colour cause it was my reddest red, and a slightly jelly finish. I'm throwing out a challenge to everyone who has bought some spectraflair. When it arrives, please try make a red holo and let me know if you succeed. Post a link to it on your blog or send me a photo. Nice!it does look red in pics! Hmmm maybe an almost black, vampy red jelly could work? Love this franken regardless! I totally love this red. Why? Because it's leaning toward the blue spectrum of the colour wheel rather than the yellow spectrum. That looks awesomely red to me! All my red attempts went so pink I made them purples. I love your frankens! 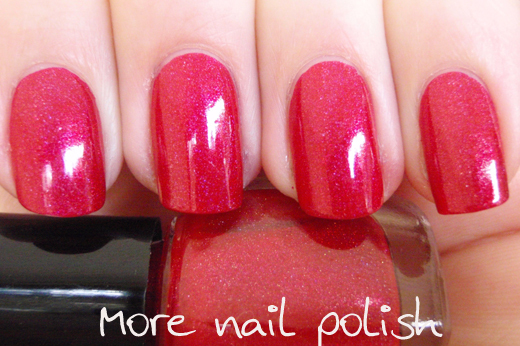 In really wish you'd start your own polish line! OMG U kill me! Those spectraflair frankens are awesome!!!!! Make me want more and more that spectra!!!! Wow!! I really love your spectraflair frankens, they are amazing! I think it would be hard to fight the grey of the spectraflair and make a true proper red. There's just something about that end of the colour wheel that doesn't want to play nice! This is as close as I have seen. Loving ALL your frankens!! I tried making a red holo and of course it turned out pink. I even tried using an orangey-yellow based red and it STILL turned pink. I am at a loss. I really like your effort though; it looks red enough to me! Gorgeous, and YAY I have those ingredients. My morphing powders & spectraflair arrived today! terribly excited to have a play!